This weekend marked the kick-off of one of the boldest, and most creative, student-led climate actions I've seen yet. 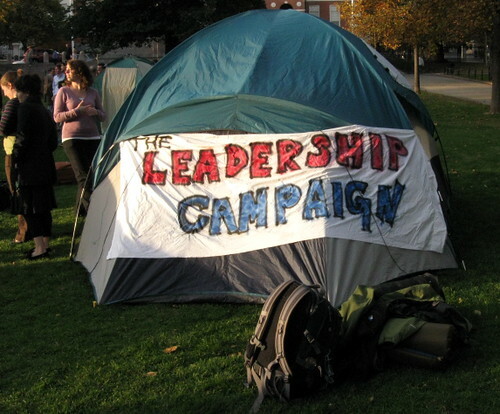 Students from 24 colleges around Massachusetts, with the support of religious groups and community members, are putting The Leadership Campaign into action. They are sleeping outside their dorms, homes and apartments (started October 24th) until the December 7th, when the United Nations' international climate treaty negotiations will begin in Copenhagen, Denmark. "Nothing less than 100% (clean electricity). Nothing more than 350 (ppm)" is the Leadership Campaign slogan. They are demanding bold climate solutions for their state, nation, and world by protesting the dirty energy (primarily coal, oil and natural gas) that powers their dorms and homes. They are calling for Massachusetts to lead the nation and the world by passing legislation that will require the state to get 100% of its electricity from clean energy sources by the year 2020. They want an international climate treaty out of Copenhagen that is based around bringing the atmospheric levels of carbon dioxide back down below 350 parts per million (ppm). This is the level that some scientists, led by James Hansen of NASA, say is a safe upper limit for carbon dioxide in our atmosphere. We are currently near 390 ppm. The students will be sleeping outside in their communities each week, but will convene on the Boston Commons, outside the Massachusetts State House, each Sunday night for a larger Sleep Out. Every Monday morning they will wake up and march up the stairs to the capitol to lobby the state legislators to pass the bill they've written. I'm going to keep my eye on this group as they call for these bold solutions! May they inspire our leaders to do what's needed to protect our planet and our future!